if you've been following the adventures of anth and ben for some time now, you may recall Ziya and Myka. ziya and anth have known each other since he was 9 months old. 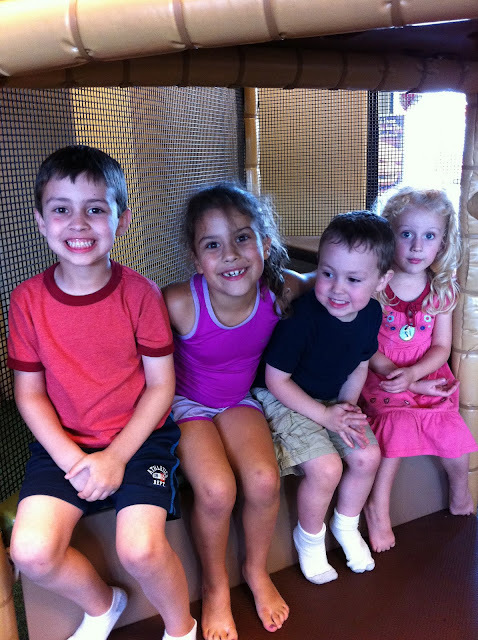 they were in the same daycare until they wandered off to different kindergartens. ben has been following one year behind myka in his classrooms and will be joining her pre-school room in August. the kids tend to love and fight with each other like siblings. the girls are an equal match to our boys, except for the long curly hair and purple attire. ziya is the older, wise, rule-following and maternal one. myka = ben, except for the fact that, according to her parents, she knows the rules and learns how to get around them. ben knows the rules and just disregards them. perhaps he feels they are just suggested guidelines. anyway, in summary, myka was ben's first date. tonight, we took it to the next step. the kids went on a double date. because they are not quite of a legal driving age, all their parental units went with them. this was a supercool kind of date. originally, we were supposed to go to the Mellow Mushroom, a newish pizza place in the area. 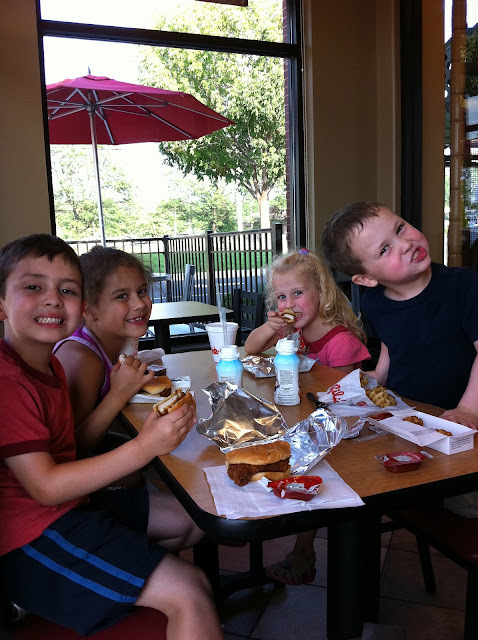 but, the day before, Ziya suggested that Chick-fil-A would be a more suitable location. anth was quick to agree. you see, Chick-Fil-A has "the best chicken ever," according to anth. and, there is always the possibility of getting a shake there. which he usually is so the odds work in his favor. personally, bern and i appreciate the play area that allows fidgety three-year-olds to get their sillies out. the kids got their own table right next to ours. except for that whole thing ben decided to do with his face in this photo. 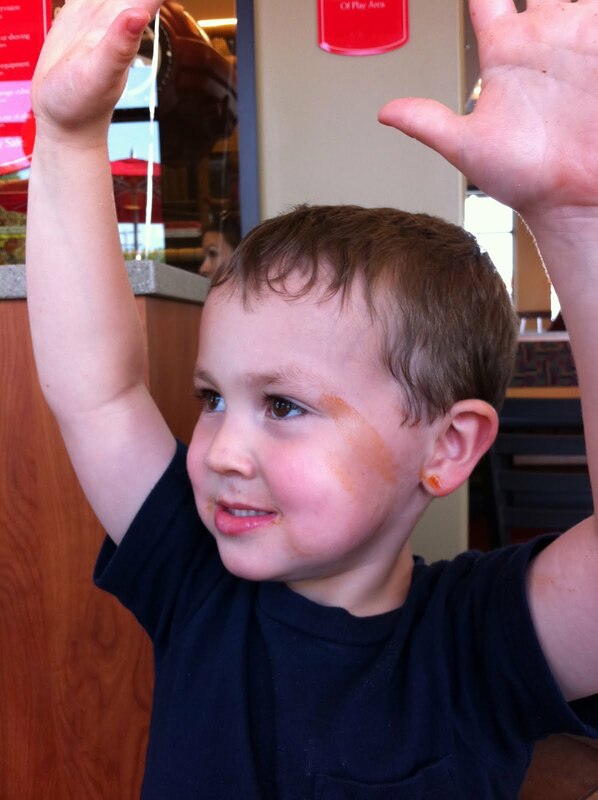 and then we had to take a brief clean-up break when he did this to his face next. the savvy boys love them some ketchup. at this point, one of the staff came over and offered the kids balloons. benny called green, ziya yellow, and myka red. yep, my 6-year-old opted out of a free balloon. i leaned over to make sure he really didn't want one. "why, mom? it will just lose it's air, anyway. they're not that big of a deal." the highlight of the evening for the kids was the indoor playground. of course, i'm the boring adult who made them all sit down to take a picture. while the kids were in the playroom, Ziya, eternal mother hen, declared that she would "take responsibility for Ben." i could probably trust Ziya almost as much at most teenage babysitters, so this seemed like a good arrangement. myka soon came out of the playroom. she was troubled that ziya wasn't allowing her a turn to take responsibility for ben. bern made a deal with her that she could take responsibility for him when he starts in her preschool room. they pinky swore on this so it is now official and she seemed okay with that resolution. 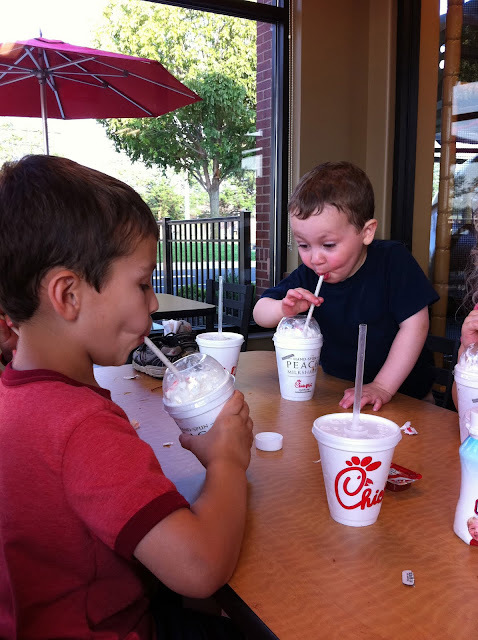 then Mike treated the kids to shakes. which, clearly, ben was really into. the parents paused for a moment to listen in on the kids' conversation. at that point, benny was holding up fingers and stating, "i was two. and then i was fwee." clearly, they were in the middle of a deep conversation. Mike asked ben, "oh really? were you?" anth, deadpan per usual, briefly turned to mike to offer, "yes. that's true." the girls parents' are fun people. it was a great evening, and a wonderful reminder of how much we enjoy talking to people over four feet tall outside of work. the kids are already coordinating their calendars for the next big soiree.